Our stockings were easily one of my favorite parts of Christmas morning growing up. I picked up this stocking for Ellie after stalking the Anthropologie website since JULY - I seriously checked it at least once a week, waiting for the Christmas stuff to come out. 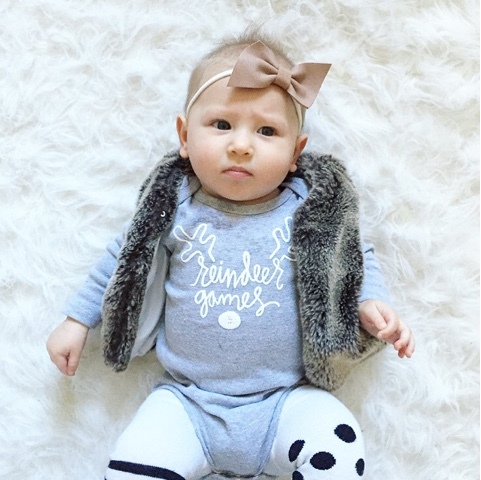 I wanted to get one that could easily be paired with other babies stockings in the future and I have loved the Anthro ones the past few years. It's cute, but it's a pretty good size so we've got lots of stuffing to do! I love the idea of mixing fun things with some useful items, and maybe a sweet treat or two. ;) Here are some of the tiny gifts that will likely find their way into Ellie's stocking this year. A sparkly bow for New Year's Eve (which we will most definitely be spending at home in our pjs). A cell phone + TV remote of her own because she's always trying to steal ours. A tiny toothbrush + tasty strawberry toothpaste. 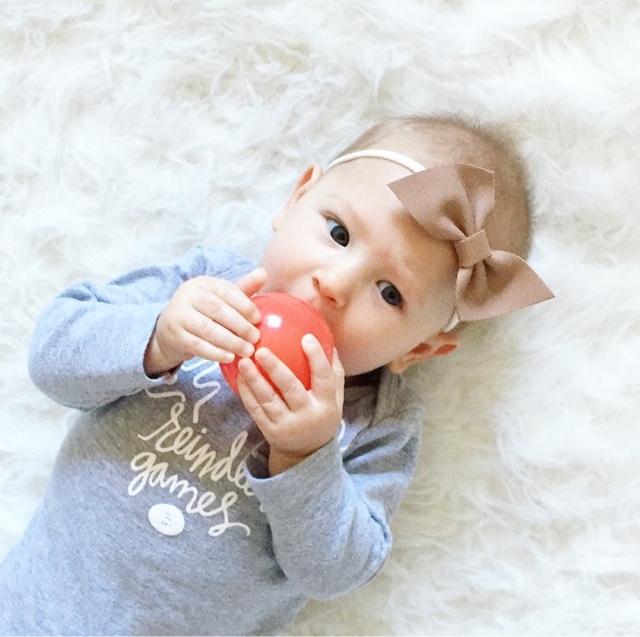 This one was recommended to me by my dental hygienist when Ellie was approximately two months old, so I figured I'd give it a shot. I am neurotic about teeth-brushing, so you bet I'll be brushing hers as soon as she gets her first tooth - twice a day! Or I'll be attempting to at least. I am really hoping she has a tooth or two before Christmas (for her sake), but will include an extra in her stocking anyway! A few new bath toys to make it more fun as we graduate out of the baby tub. Some baby-safe nail polish, in case she ever lets me paint those piggies! Some small toys that Ellie can easily grab and put in her mouth. 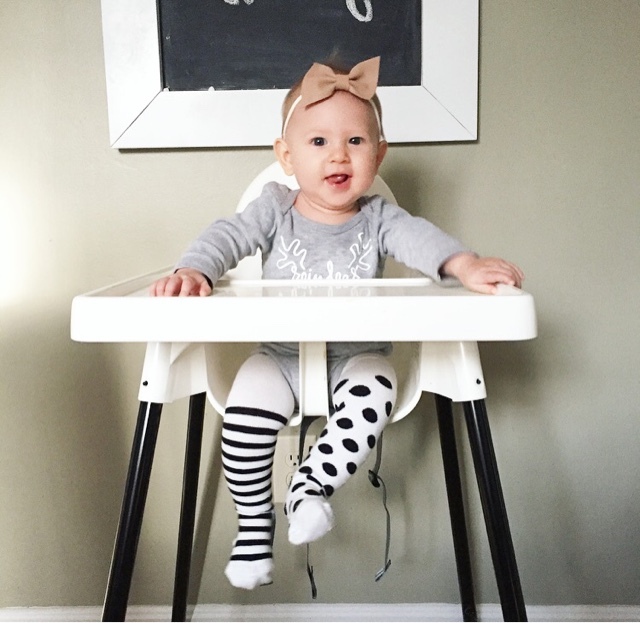 Some fun, new socks because babies feet grow constantly. Puffs + yogurt melts, because a stocking isn't complete without something to eat! Yep, I went back and changed the wording so that would rhyme. It's a little tricky at this age, mostly because she will not care much about it. Of course we still want to put a stocking together for her regardless of that fact, so I will be trying to kill two birds with one stone and include lots of things that we would otherwise buy for her anyway. We love adding to our little library, so I'll probably try to find a small book or two to include as well. 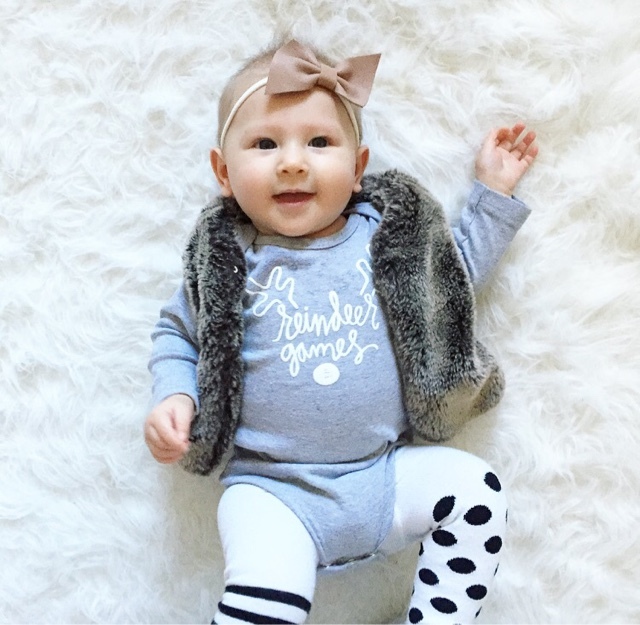 Ellie will be eight months old the day after Christmas - I'd love to hear any age appropriate suggestions you have to add to our stocking shopping list! Hang on to your antlers, people - only 45 days until Christmas!